Australia Post postcode list – it isn’t the same as a comprehensive list of suburbs..
You’re not the first to be confused by the Australia Post list. Many believe it to be the definitive list of Australian suburb names, it isn’t, it’s a list of destinations Australia Post delivers items to, including bank lobbies, PO boxes, locked bags and remote rural blocks, and the “suburbs” most of us live in too! Here’s some factual clarification. We’ve created a map which illustrates how the hierarchy of “names where people live and things get delivered to” works – click the image to go to the download page – it’s a bit too big for local storage. The main thing to note is that many sparsely populated satellite localities, or hamlets – small clusters of rural dwellings without their own shops, services or places of worship – have names (yellow halo names in the map), which often appear in the Australia Post list. However most residents of such localities would use the formal containing “suburb” name (white halo text) instead of / in addition to the hamlet name. The overwhelming balance of Australia’s resident population lives in formally designated and named suburbs within the orange bordered areas (15000+). 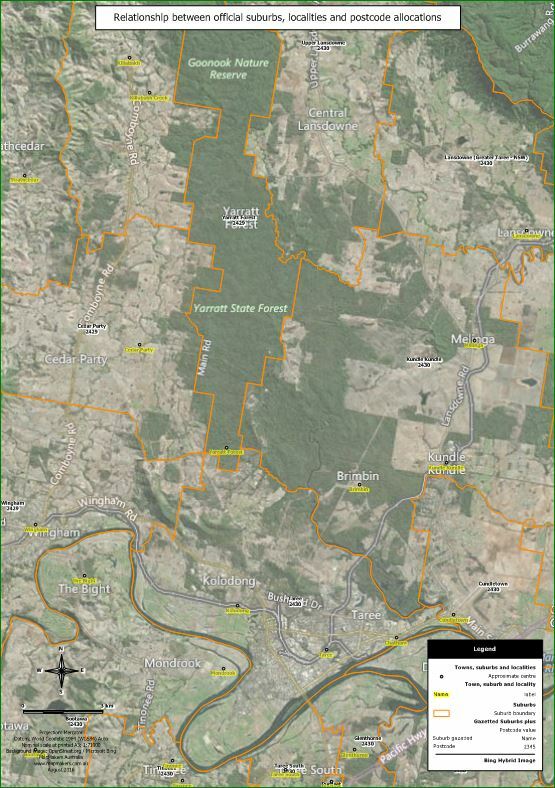 For example the majority of the population of the designated suburb of Taree live in Taree itself, while just a few live in the hamlet of Kolodong. In practice, residents of Kolodong would probably shop in Taree, may get their mail delivered to a PO box there, and may be on septic and tank water services. The satellite hamlets are too vaguely defined for distinct containing borders at national level, hence convention has them displayed as points at their approximate centres. 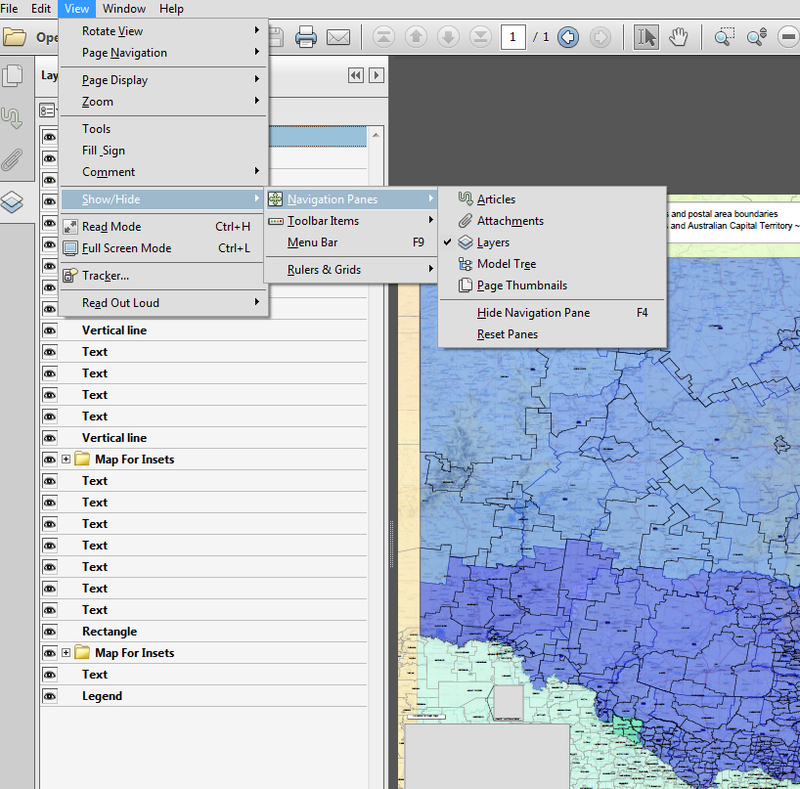 You can see this in the downloadable map – if you zoom in and toggle the two background layers on/off (quick “how to” screenshot here if you’re not familiar with Adobe layers), you’ll see it’s quite common for two sources (Open Street and Microsoft Bing) to differ in where they place the labels for satellite localities (Brimbin is an example). You’d probably see a third placement from a Google map. The points with yellow labels are from our in-house localities database, compiled from a number of sources including the national gazetteer and under continuous update and revision from a growing range of sources for over the years. If there was a definitive national data set, we’d have been using it, but we’ve made our own for good reason; at the time of writing it has over 16,000 records and doesn’t include PO boxes or other uninhabited entries like the AP list. From a practical point of view for most purposes, area objects, not points are preferred. Even processing the Australia Post list with coordinates (the list is no longer “free”), you would only end up with points, many stacked on top of each other and with no more claim to definitive accuracy than any point used to represent an area in geographical space. Indeed the satellite locations would probably occupy another slightly different point in space to the other sources noted here. Important to note we use the term “source“; that’s intentional, because there isn’t a definitive authority for location at national level – Australia Post are happy that people assume it is them, but it isn’t.